A door stands open outside of the art building. Music streams through the open passage, classic rock fills the air. Inside, students mill about the room. Some sit at the pottery wheels, spinning clay into works of art. Others students shuffle through the back room, some with paint brushes covered in glaze readying themselves to stain their work forever. Over the music a voice can be heard singing, loud and gruff. The voice belongs to Rodney Mott, an adjunct professor who teaches ceramics at American River College. But that is not all Mott hopes his students will gain from the experience. “We are teaching people to balance their lives,” Mott said. Mott said he also believes there is no reason for a student to be worried about their ability to create. “These are all examples of things people who thought they couldn’t make anything and ‘Bam!’” he said, as he pointed to a worktable lined with sculptures and pottery. It’s important to Mott that his students enjoy the process, and for that reason students are given the freedom to create what they want. “I always love to be productive and do things with my hands, and after I retired it was a good opportunity to follow a dream,” said Gita Ivey, who took the class in the fall of 2017. Ivey’s favorite piece she made in the class was the result of an accident. “I made a bowl, but as I was trimming the bottom of it, it flew off the pottery wheel, and it became crooked,” Ivey said. She decided to give it to her cat as a water dish. Ivey painted fish around the exterior and wrote her cats name upon it. “After I glazed it, it was the coolest pot I ever made… It’s the center of conversation in my house,” she said. It was from this experience that Ivey learned the lesson Mott tries to teach his students. “There is no right or wrong [in this class] there is no mistake. Everything you make is a piece of art and don’t judge yourself,” Mott said. Brienna Edwards is a second semester student with the Current where she serves as co-editor-in-chief. She has previously served as features editor. Edwards is currently majoring in journalism and photography and plans to transfer to California State University, Sacramento in spring 2019 after finishing her photography degree. 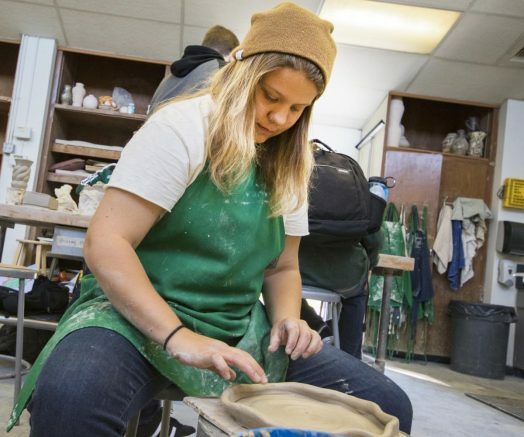 Be the first to comment on "Take This Class (TTC): Ceramics (ART 390)"